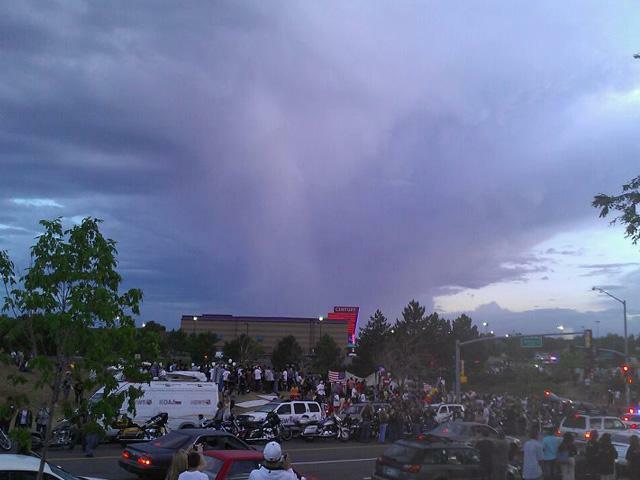 A 7NEWS viewer took a picture that shows what appears to be an outline of an angel in the clouds above the vigil site for the Colorado Theater victims. Crystal Fuller took the photo after the vigil was finished Sunday night, but said she didn’t notice the image of the angel right away. “I noticed it afterwards. I had it posted and said crazy cloud … one of my friends, Barbara Masias, said it’s an angel and I saw it!” said Fuller on the 7NEWS Facebook wall. The shape of the angel in the clouds appears directly above the Century 16 movie theater in Aurora, she said. Personally I think the picture looks like an angel shape. What do you think, does it look like an Aurora Angel to you?